This year, we found a fun way to spend New Year’s Eve that was just the right speed for us, although it will be cost prohibitive to do it again any time too soon. 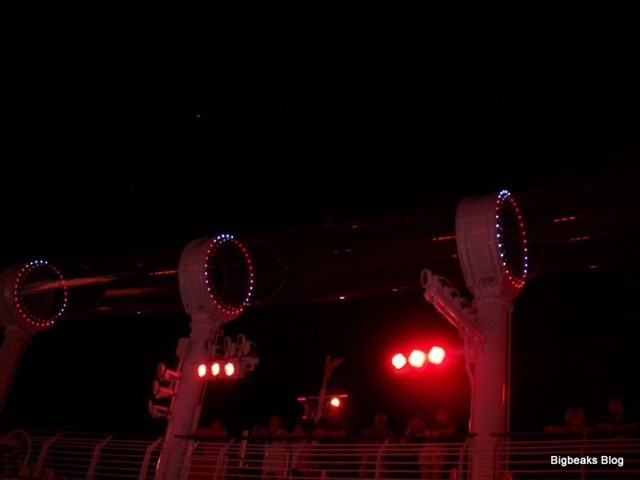 This year, we took the New Year’s week cruise on the Disney Fantasy cruise ship! My family enjoys doing something for New Year’s Eve, but we aren’t particularly crazy about dealing with huge crowds and complicated logistics. While we have spent many quiet New Year’s Eves at home, we have also occasionally tried something a bit more grand, including a party at some friends’ house for 1999/2000 and a couple visits to Legoland California in recent years. My wife and I spent New Year’s Eve at Disneyland together one time, although it was actually a few weeks before we officially went on our first date. New Year’s Eve at Disneyland was a fun experience, but not one that we have wanted to repeat. 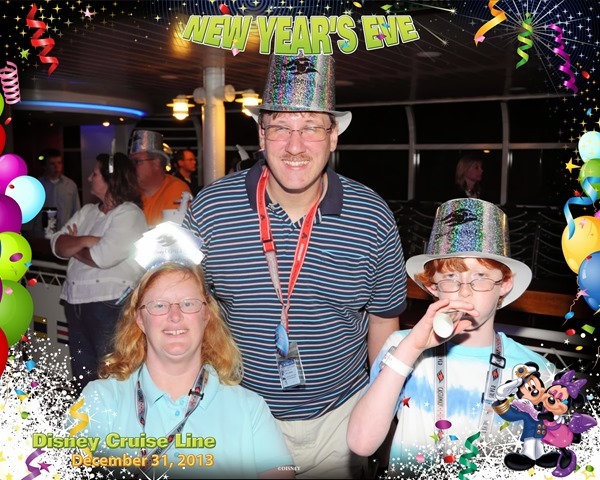 The cruise was a New Year’s Eve experience that was full of excitement and fun, but with crowd sizes kept very manageable by the ship’s capacity and logistics that made for a relaxing and never-too-complicated day. Sure, there were a lot of logistics (and cost) involved in planning out the cruise and getting there, but the vast majority of stress and complication melts away once on board the ship. During the daytime, New Year’s Eve was a port day on the island of St. Maartin. We were able to sleep in a bit and have a leisurely breakfast at Cabana’s, the ship’s buffet restaurant. We then spent the rest of the morning just relaxing and enjoying some of the ship’s amenities with a quick lunch at one of the fast food stands on deck. 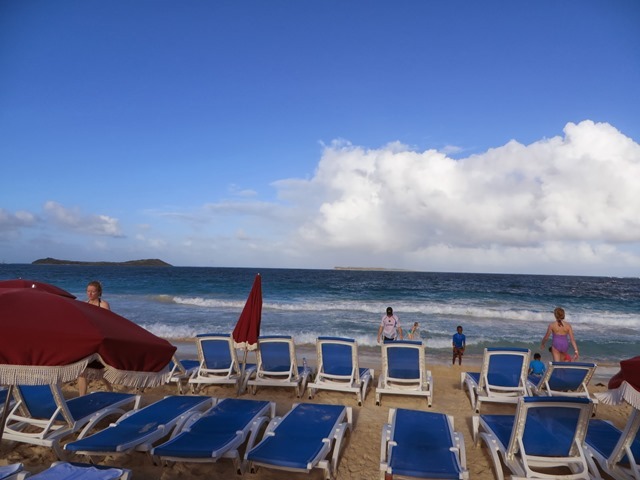 In the early afternoon, we went on a pre-arranged shore excursion to Orient Bay Beach, one of the island’s largest and best known beaches. Yes, we spent New Year’s Eve afternoon at the beach! 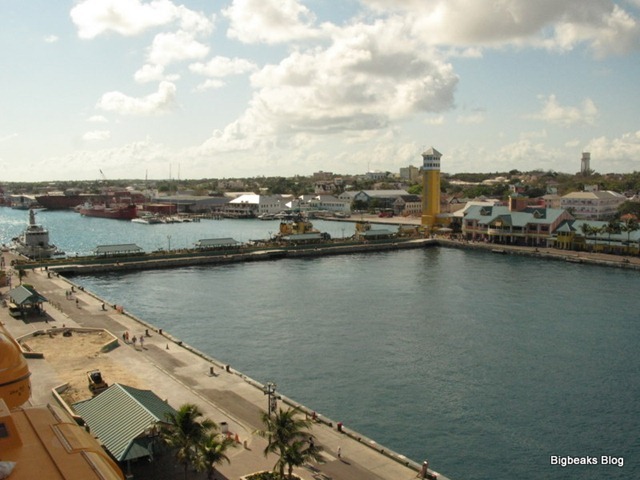 On the first full day of the cruise, the ship was docked at Nassau, the Bahamas’ capital city. 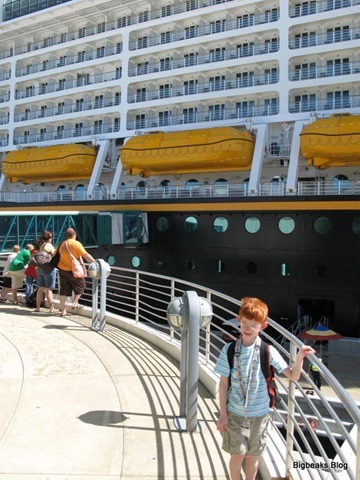 Our only previous visit to Nassau was during our previous cruise on the Disney Wonder. 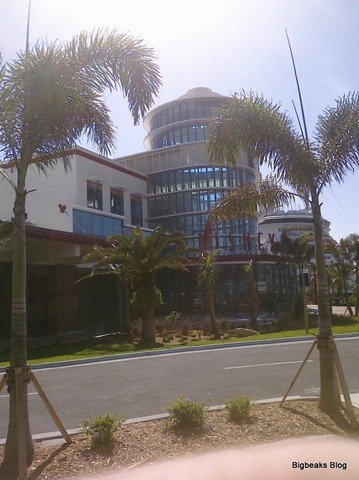 On that cruise, we took a shore excursion over to the Atlantis Resort, a popular luxury hotel and casino, which also features an aquarium. It was fun, but a very touristy spot with little-to-no local color. This time, we wanted to see a bit more of the city and perhaps get a little more of a taste of the local culture. When reviewing the offered shore excursions, it was quickly obvious to me that a good choice for us was the one that featured a visit to Ardastra Gardens, which is a local zoo, followed by a bus tour of the city. This was particularly appealing as the featured attraction at Ardastra Gardens is the "world-famous marching pink flamingos". Pink flamingos are my wife’s favorite animal, so this sounded like something she would particularly appreciate. The excursion left the ship at 12:30pm and lasted for about 2 hours, which left us with plenty of time on-board the ship in the morning and the late afternoon and evening. We wanted to have plenty of time to explore the ship and enjoy its features, so this was about the right length for the excursion. For breakfast, we decided to try out Cabanas, the buffet restaurant on deck 11. Cabanas is pretty different from the equivalent restaurants on the Magic and Wonder. It has a much larger indoor seating area and has also been changed from a traditional cafeteria-style buffet into more of a food court format with stations for different kinds of food. Another interesting change is that Cabanas is a table-service location during the dinner hour, offering a more casual alternative to the main dining rooms while still serving the same 4-course meals. At the entrance to the restaurant, greeters were stationed to guide guests to a table and give a brief overview of the available food. I definitely prefer this approach over being left to find a table on our own. We were taken to a table next to a window and had a really great view during our meal. The breakfast offerings were pretty typical for a buffet. They had scrambled eggs, bacon, sausage, potatoes, Mickey-shaped waffles, pancakes, and a variety of fruit, cereal, and pastries. Drink stations on either end of the restaurant offered juices, coffee, and soda. I only like eggs that are very well-done and the eggs they had were way too runny for my taste. Because of this, I mainly stuck with waffles and fruit. I don’t know if they would have prepared some better-cooked eggs for me if I had asked, but they didn’t have a cooked-to-order egg station. 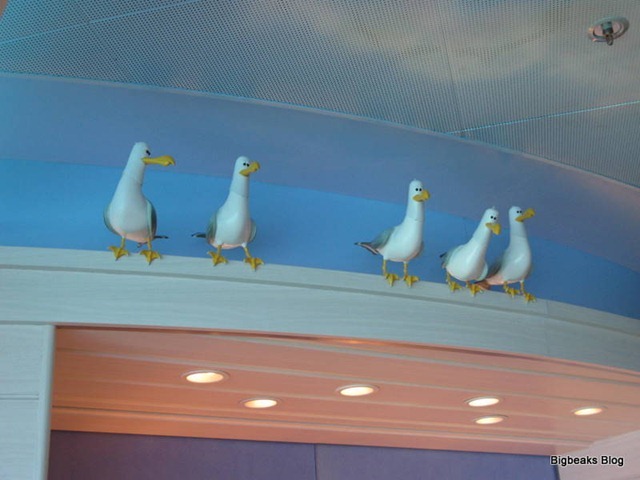 The seagulls from Finding Nemo were perched on a ledge near our table. The food was pretty decent for this type of buffet and the decor of the restaurant, which is largely inspired by Finding Nemo, is pretty nice. We actually ended up having our breakfast at Cabanas three of our four mornings on-board the ship. After dinner, we had a little time before the evening’s theater presentation and we decided to explore the shops on deck 3, located near the Walt Disney Theater. There are actually three shops in that area. 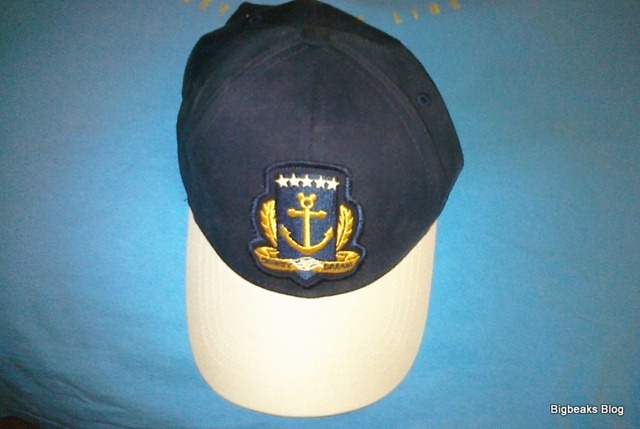 Mickey’s Mainsail is the main source for typical Disney souvenirs, including t-shirts, hats, plush, etc. The selection includes a lot of merchandise with the Disney Dream logo as well as some more generic Disney Cruise Line items. 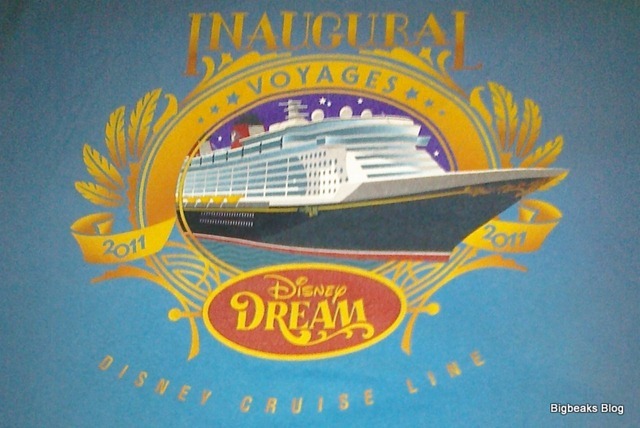 At least on our cruise, much of the Disney Dream specific merchandise still was identified as being for the inaugural voyages. We bought t-shirts and hats here and I was also able to get a model of the Disney Dream to match one that I bought on our earlier cruise on the Magic (the one sold on the Wonder was identical to the one on the Magic). Across the way from Mickey’s Mainsail is Sea Treasures. This store features some more upscale clothing as well as some higher-end merchandise like watches and jewelry. This store also has a fairly large toy section. 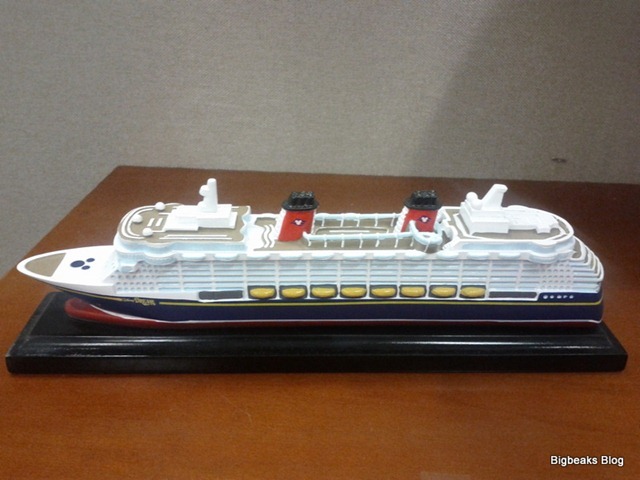 Most of the toys are not cruise-specific, although they do have some Disney Cruise Line plush here. My son found and purchased (with some of his saved up allowance) a plush cruise ship containing plush figures of Mickey and friends dressed in nautical outfits. It is very cute, although he was a bit disappointed to discover that the characters are sewn in. The third store in the area is Whitecaps, which is primarily a duty-free liquor store, although they do also stock a number of sundries, such as common over-the-counter medications, sunscreen and other similar essentials. All of the shops on the Dream are only opened while the ship is at sea, which allows them to sell all merchandise duty-free (tax-free). Guests do have to declare all purchases at the end of the cruise and will be charged taxes if you exceed the $800/person duty-free limit. Note: I didn’t get any photos in the theater or The District, which is why there aren’t any more pictures in this post. Disney’s ships employ a full theatrical troupe that perform in elaborate productions in the Walt Disney Theater. While this is not unique to Disney’s cruise line, the shows benefit quite a bit from Disney’s experience with live productions, including those for Broadway and the theme parks. The result is a pretty consistently high quality to the shows presented on the Disney ships. The shows also benefit greatly from Disney’s extensive library of stories, characters and songs, which provides strong source material for the shows to use. On both of our previous cruises, the first night featured a "Welcome Aboard" variety show instead of a full-blown theatrical production. On those previous cruises, we skipped that opening night show in favor of more general exploration of the ship’s features. The schedule was different on the Dream, though. The first night featured one of the major productions, "The Golden Mickeys", which we didn’t want to miss. Registration and an open house was held at the kids’ clubs (Oceaneer’s Club and Oceaneer’s Lab) until 6pm on embarkation day. The time between the sail away and our 6pm dinner seemed like a perfect time for it. Our decision not to wait in the long line for kids’ club registration in the terminal was quickly validated as there was no line at all for registration at this time. We had already filled out the registration form online, so the actual registration really only involved the issuing of the wrist band. Each registered child is issued a wrist band with his/her name on it and a small electronic chip that is scanned to confirm identity upon arrival or departure from the club. The wristband must be returned before midnight on the last night of the cruise or a charge is issued to the stateroom account to cover the cost of the electronic device. The wristband is the kind that can only be removed by cutting it off, so the child does have to wear it through the entire cruise. They mentioned that it could easily be replaced if it did become necessary to remove it, such as if the child had trouble sleeping with it on. It is waterproof so it is no problem to keep it on while swimming or showering. We were a little worried that our son would be bothered about having to wear it the whole time, but it wasn’t an issue at all. The kids’ clubs are drop-off, allowing kids and parents to have some independence. The entry/exit is strictly controlled and a lot of effort is made to ensure kids only leave with authorized adults. At registration, parents provide a list of authorized adults as well as a password. When picking up a kid, the attendants scan the Key to the World card to confirm identity and also ask for the password. When their child is in the club, parents are asked to carry a Wave Phone for emergency contact. They will also send a text message if the child asks to be picked up. If the parents will be somewhere like Palo or one of the shows, they can request that the attendants contact only in an emergency. Although they will allow parents to accompany their children into the club, it is generally discouraged outside of a few designated family play times. The embarkation day open house was one of those times. After registration, my wife and I went in with our son to do some exploration.. It was comforting to have the opportunity to get a feel for the facility before we would later leave our son there while we went off to do other things. The kids’ club is split into two different facilities, although both are connected and the kids are able to move freely between them. 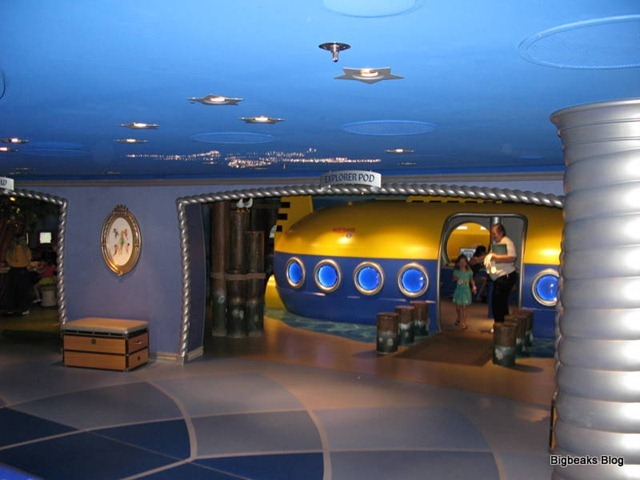 The Oceaneer’s Club is largely play-based, with several character-themed activity areas. 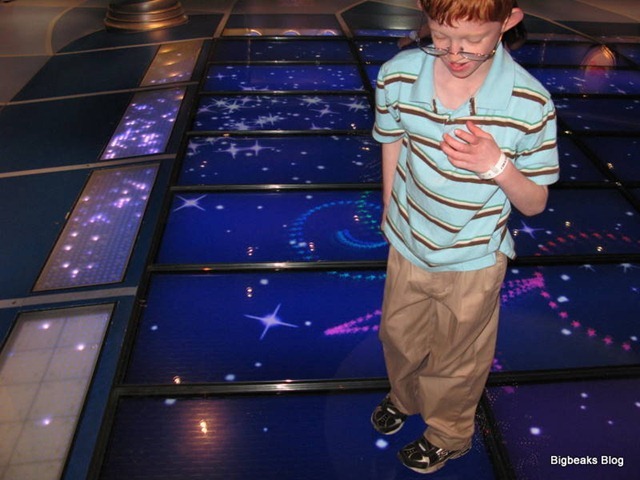 The Oceaneer’s Lab is more activity-based, with a focus on high-interactivity. While both areas are officially targeted at ages 3-10, the Oceaneer’s Club tends to focus more on the younger end of that range while the Oceaneer’s Lab has a bit more to offer for older kids. Night-time view of the AquaDuck. Somehow, I never took any daylight photos. One useful tip that I picked up while researching for the trip was to pack swim clothes in a carry-on as the pools tend to be pretty uncrowded during embarkation afternoon. Checked luggage can arrive any time up to around 6pm (our bags arrived one at a time over several hours), so having swimming items in carry-ons is a necessity to take advantage of those relatively sparse crowds. The Dream has three swimming pools: the Mickey pool for smaller children, the Donald pool for families and the adults-only Quiet Cove Pool. None of the pools are particularly deep, with the Mickey pool maxing out at 2 feet, the Donald pool at 4 feet and the Quiet Cove pool at 4 feet. Unusual for a cruise ship, the pools on the Dream (like the pools on the other Disney ships) use chlorinated fresh water instead of sea water. One of the most talked about new features of the Dream is the AquaDuck, a 765-foot tube-style water slide that starts on deck 12 and twists and turns around the upper decks of the ship, including a section that extends over the side of the ship. Guests ride on oversized inflatable rafts which each hold one or two people. It is billed by Disney as a “water coaster” and does have a roller-coaster like feel. Night-time close up of one of the tubes. The ride was closed when these were taken. I was excited to ride the AquaDuck, but my son, who is not yet a strong swimmer, wasn’t feeling ready for it. My wife also wanted me to try it first so I could describe it to her in order to help her guess whether or not it would aggravate her back condition. Therefore, I left them in the Mickey pool and headed over to queue for the ride. The wait time was posted as about 30 minutes, which was pretty much the shortest posted wait that I saw during our cruise. I found that estimate to be pretty much exactly right. A large part of the queue is outdoors and mostly un-shaded, so make sure to wear sunscreen. I’d also strongly recommend getting some water shoes of some sort. I didn’t think to do that and found that the surface was uncomfortably hot on my bare feet during parts of the queue. The last 10 minutes or so of the wait is an indoor area leading up to the loading platform. This indoor area has some cute cartoons on the wall featuring Donald Duck, Hewey, Dewey & Louie, and Uncle Scrooge. These provide a lightweight story that gives the ride a bit of theming. The layout of the cartoons was a bit strange, though, in that I found myself essentially following the story backwards. The rafts are brought up from the ride exit to the loading area using a mechanical conveyer system. A ride operator transfers the rafts from that conveyer to the slide entry way and then helps the passengers get on board. 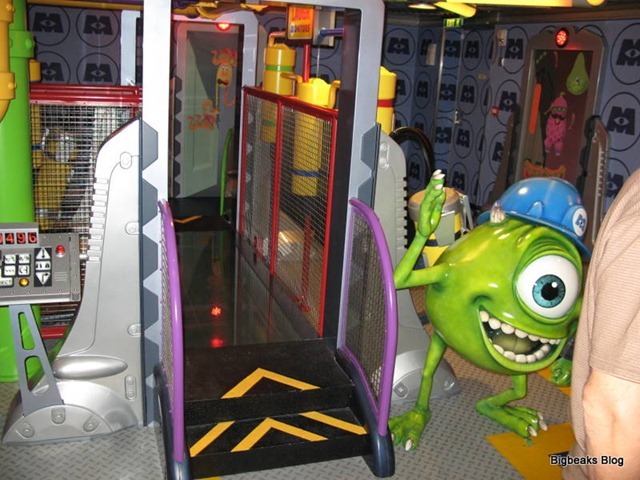 The entry way to the slide also uses a conveyer belt, activated manually by the ride operator, to launch the raft into the slide itself. A number of crew members were stationed in the lobby with the task of intercepting and guiding embarking passengers. Our helpful crew member made sure we knew that our stateroom would be ready at 1:30 and that lunch was available at either Enchanted Garden on deck 2 or Cabanas on deck 10. She recommended Enchanted Garden since it only required walking down 1 flight of stairs and there were long lines for the elevators. We debated briefly as we were also scheduled for dinner at Enchanted Garden that night, but we ended up taking her advice. The decor of Enchanted Garden is pretty much as the name implies. It is a brightly lit, elegant dining room with lots of greenery. During the dinner hour, there is a show element where the decor shifts from day to night during the meal, but this isn’t done at lunch. Like all of the restaurants on the Dream, the tables are positioned pretty close together, making for kind of a crowded look. Fortunately, the combination of bright lighting and color schemes as well as reasonably high ceilings keep the restaurant from feeling claustrophobic. Upon entering the very uncrowded restaurant, we were immediately greeted by one of several crew members waiting by the entrance who escorted us to a table close to the buffet. A waiter took our drink orders and then we headed to the buffet to get our food. Since we had all of our carry-on bags with us (including laptop computers), we were glad to have a table very close to the buffet as this allowed us all to go get our food without requiring that someone stay behind to watch the bags. The buffet included a carving station with roast beef as well as some of the typical side dishes to go with it. They also had salads & fruit, cold cuts and cheeses, a number of different varieties of bread, peel & eat shrimp, and some pasta and fish dishes. A well-stocked dessert area offered lots of different selections of various baked goods (cakes, cookies, etc.) and a freezer with quite a few different flavors of premium-quality ice cream. The food all seemed very fresh and we enjoyed everything we had. The servers were very attentive and quick with drink refills. 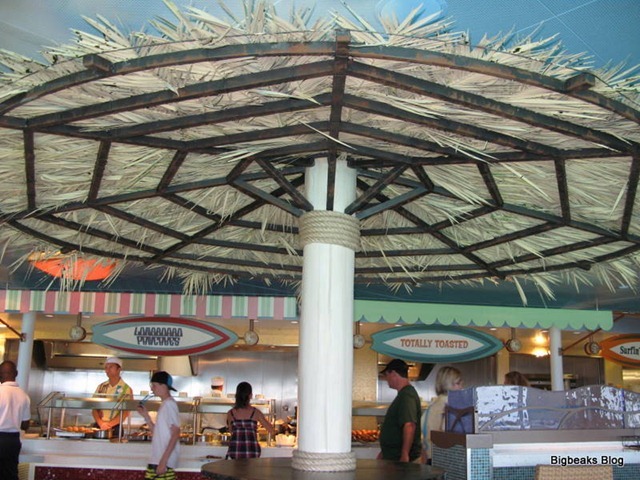 From what I’ve heard, the food selection is pretty much the same at Cabanas, but with a self-service drink station. I felt having servers take care of drinks was preferable, particularly for the first meal of the cruise. One of the servers even took a couple minutes to fold a napkin into a hat, which greatly amused my son. One of the highlights of our previous cruises was the brunch offered on days at sea at Palo, the adults-only restaurant. A limited number of reservations are available on-line, but they were already full (probably due to earlier booking dates for concierge and high-level Castaway Club guests) by the time we were able to book. Through research, I had learned that a large percentage of reservations are held back for guests booking on board. They started offering these reservations at the podium outside of the restaurant, starting at 1pm on embarkation day. It was shortly after 1pm when I finished eating lunch, so we decided that I would head up to Palo to try and make a reservation and then meet my wife and son back at the stateroom at 1:30, the time the staterooms were scheduled to be available. My journey to the restaurant was my first experience with how large the ship is and how difficult it sometimes was to get from one place to another. 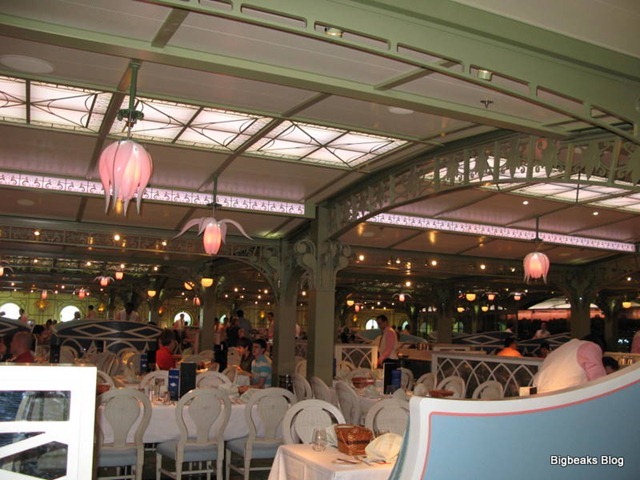 Enchanted Garden is located midship on deck 2 while Palo is located far aft on deck 12. I first headed to the midship elevators, which I discovered only go as high as deck 11. I later learned that 4 of the 6 elevators did go all the way up to deck 12, but I got into one of the two that doesn’t. I’m not sure if there were signs up clarifying this, but I didn’t notice any. Once I got up to deck 11, I had some difficulty finding the aft elevators and stairs. It turns out that they are, rather confusingly, actually inside of Cabanas. I had to ask a crew member for directions before I finally figured that out. After I found the stairs, I walked up one deck and easily found Palo right there. Note: I have decided to split each day of the trip report into multiple parts as the posts were getting overly long. I was a bit nervous about the logistics surrounding embarkation on the Disney Dream. 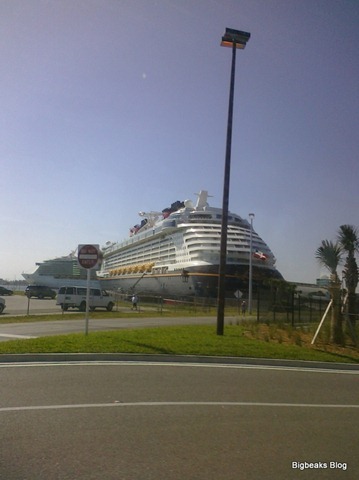 The Disney Cruise Line had traditionally been known for a very smooth embarkation process at Port Canaveral, but the terminal was designed for the substantially smaller Disney Magic and Disney Wonder and there had been quite a few reports of problems handling the larger crowds arriving for the Dream. 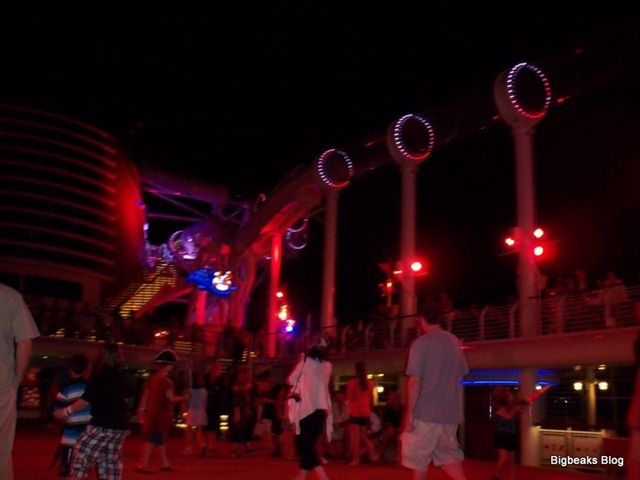 For our previous cruises, we had arrived at the terminal via Walt Disney World transportation, which got us there late enough that we immediately went on board after checking in. This time, we had rented a car and planned to arrive at the terminal as early as possible, so I wasn’t really sure how it would work. Fortunately, we found that the embarkation process went very smoothly and with a minimum of hassle. On Sunday morning, we managed to wake up fairly early and it didn’t take too long to get showers and pack everything up. We had a light breakfast at the hotel’s breakfast buffet. Holiday Inn Express has pretty much standardized their included breakfasts from location to location, meaning that the quality and selection is predictable and fairly decent. I particularly like their cinnamon rolls, which are served warm and fresh. My only real complaint about breakfast was that they didn’t have enough seating in the breakfast area, something else that is unfortunately fairly standard to the chain. We had to squeeze all three of us around a table for two, but we were able to manage. I was very unsure about was whether it would be better to drop my family and our luggage off at the port and then go to return the rental car by myself or for us all to just take the shuttle. We finally decided that the logistics would simply be easier if we all took the shuttle, so we headed straight to the rental car return. We found Budget’s return process at the Port Canaveral office to be chaotic and a bit confusing. We initially expected someone to come out to meet us to check in the car, as is typical at airport returns, so we wasted a few minutes waiting for that. Once we realized that wasn’t the process there, I noted that the paperwork had instructions for doing an express check-out by filling out a form and dropping it in a drop box. When I went inside, there was no drop box in sight. This left no choice but to get into the line, which was very long due to the large number of people returning from cruise ships that had arrived in port that morning. Fortunately, we didn’t wait too long before an employee walked the line offering to collect express check-out forms. While the process wasn’t exceptionally difficult, they definitely should put in a drop box and also place some signs outside giving instructions for returns. The wait for a shuttle bus was, fortunately, short and we were soon on our way to the Disney Cruise Line terminal! We arrived shortly before 10:30am, which was the time that the terminal opened. The shuttle pulled up at a drop-off spot outside the terminal and a cruise line porter quickly collected our checked luggage. We then joined the line of people waiting to go in, which ended pretty much right where we had been dropped off. It took us about 20 minutes to make it up to a security gate, where they checked our cruise documents and IDs before directing us into the terminal. Inside the terminal, we then passed through airport-style metal detectors and sent our carry-on bags through an x-ray machine. This process was very quick and efficient and we were soon headed up the escalators to the main terminal area. We then were asked to quickly sign a form stating that nobody in our family had been sick in the last 24-hours and then we were directed to the check-in line.